Hekerua House & Studio is a 3 and a half bedroom 2 bathroom holiday home, which includes a studio downstairs. This Oneroa escape is ideally situated on Waiheke Island and is perfectly set up for a group or family getaway. This comfortable 90s home has an expansive deck with a bohemian shaded lounge area, a semi shaded dining area and an open area with deck loungers. From shade to full sun, theres something for everyone. The perfect spot to relax and unwind with a cold drink and a bbq. Sitting above native bush, there is lots of bird life and a closeness to nature. The self contained studio includes both a double and single bed, as well as its own kitchenette and bathroom, perfect for those looking for a little extra privacy, ideal for Grandparents or extended family. The upstairs has an open plan living and kitchen area with a queen bedroom located, a queen bedroom located downstairs and a small single fold out bed located in the downstairs alcove. There are 3 toilets (no queues!) and 2 bathrooms ideal for 8 people. While situated in a peaceful setting, Hekerua House is only a 15 minute walk from the popular Little Oneroa Beach for lazy days at the beach. For the wine lovers of the group the famous Cable Bay Vineyard is just a 7 minute drive away, and Mudbrick Vineyard and Restaurant is only 9 minutes away. Please note the property is on two levels and has stairs. In consideration of our neighbours, no parties please. Minimum stay requirement apply to Long weekends and public holidays. Cleaning: Guest responsibility to leave property as you find it or $150 cleaning service by arrangement. Linen hire: $20.00 per person. 6 seats at lounge dining table and 2 extra on deck dining table which can be used in lounge. I spent the weekend here with a group of friends celebrating my birthday. The house was even better than we expected, it had everything we needed. Close to bustops so easy to get around and good location - not far from the beach/shops. Judith was so lovely to deal with- she answered any questions I had promptly and was flexible with our check in. Definitely recommend Hekerua House and we would love to stay here again! Thanks for your wonderful review Courtney. You and your friends are welcome back anytime, you were great guests. Spent two nights at this island paradise and we all thoroughly enjoyed our stay. Plenty of room for a large group/family. Heaps of outdoor space (both grass area and decking). The house is in a great location, and was set amongst a lot of trees - loved hearing the Tui while we sat on the deck. Loved the little outdoor conservatory area too. Super relaxing and comfortable kiwi bach. We had pretty much everything we needed except didn’t appear to have any tea/coffee however it was only a short trip to the store to get this ourselves. Overall, Judith was a great host and very flexible with us - we hope to stay again in future. Thanks so much for having us! Clean quiet comfortable spacious indoor/outdoor relaxation! Just the perfect place for our 50th wedding anniversary celebrations with our family. Grandkids loved it too! Judith was a nice warm welcoming host. Thanks for your lovely feedback, Athish and Gyanendra. It was an absolute pleasure to have you rent my house for such a wonderful occasion. You are welcome back anytime. Best wishes, Judith. My partner and I rented this home for our wedding guests and they had a great time there. It was a close drive to the beach and Oneroa shops, it was nice and roomy, and it had plenty of sunshine on the deck in the afternoon. Judith was incredibly helpful and responsive to any questions we had. Our group had a great time. Judith was incredibly helpful and checked up via messages to see if we need anything which was very sweet. Kitchen was incredibly well equipped. Beautiful outdoor area. Great great spot! Thank you so much for the lovely review Dahlia, you’re welcome back anytime. We loved our time here. Judith is a wonderfully friendly host, and was flexible with our arrival time. The house was immaculate and perfect for our family. 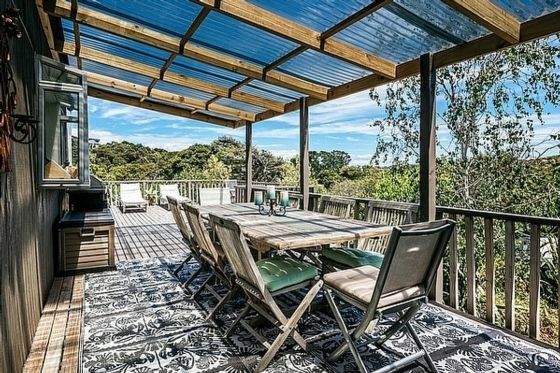 The outdoor deck space is absolutely perfect for hanging and eating. Location great as it is 10 minute walk to Little Oneroa beach, and 20 minute walk to the shops in Oneroa. Would definitely stay here again. Thankyou so much for the wonderful review Stefan. It was a pleasure to rent to you and you’re lovely family. Thanks for choosing my place. I look forward to you coming again.